Twilight Struggle is a board game designed by Ananda Gupta and Jason Matthews, and published by GMT Games in 2005. It’s a 2-player strategy game, taking place during the Cold War 1945 – 1989. One player takes the role of the USSR, whilst the other plays the USA. The game is a classic card-driven strategy game, where each card can be used in several different ways. The cards depict different historical events that occurred during the Cold War, and more cards are added to the deck as the game progresses, adding more events that happen later in the timeline of the game. The game takes place on a board which depicts a number of countries in Europe, The Middle East, Asia, Southeast Asia, Africa, Central and South America. The idea of the game is to place influence into countries. Control enough countries, and you control the region. The premise is simple. However, there is a complex interplay with the cards that makes the game fascinating to play. We played this game for several weeks early in 2016, and it reminded me just how good a game it was – even if it is a bit of a brain burner. The game has a very steep learning curve, but once you get the hang of it, it’s hugely enjoyable and always challenging – definitely a must buy if you like intense head-to-head strategy games. The game has been hugely successful – it was ranked #1 on Boardgamegeek (i.e. the best boardgame in the world) for several years. Indeed, it’s still ranked #3. Back in 2014, GMT Games ran a Kickstarter campaign to produce a digital edition of the game. I thought this would be an interesting game to play digitally, so I backed it at a level where I not only got the digital edition, but also some physical expansions for some new content for the game. The physical content was delivered on time back in 2015, but the digital content has taken a long time to arrive. I wanted the game on Android – and this ended up being the last version of the game that was developed, after it arrived on PC, iOS and iPhone. The game was finally delivered just before Christmas 2016 – about 19 months late, which was frustrating, especially when non-KS backers on other platforms have essentially been playing the game for 6 months or more. That said, I have now had chance to play the game, and the digital version is a very good implementation of the boardgame. The user interface is easy to use, and everything looks good, even on a small screen (I’ve been playing on my Sony Z2 phone). I’ve only been playing the game AI in offline mode so far. The AI does seem to provide a good challenge – either that, or I’m just rubbish! I even discovered a new crinkle on the winning conditions which I wasn’t previously aware of (You lose the game if you trigger a thermonuclear war – what I didn’t realise is that if your opponent triggers the war via a card that you have played, you are deemed to have started the war. The computer AI has done it to me three times now!). If you are worried about the complexity of the game, there is a very good tutorial mode. However that really is only the start, and you will need to get several games under your belt before you really feel that you know what you are doing. As for strategy, a simple Google search will reveal a huge number of articles written on this subject. Despite being a digital edition, there is no getting away from the fact that this is a long game: be prepared for a single game to last for 2-4 hours. Thankfully games can be stored, so its easy to play a game over several sessions. 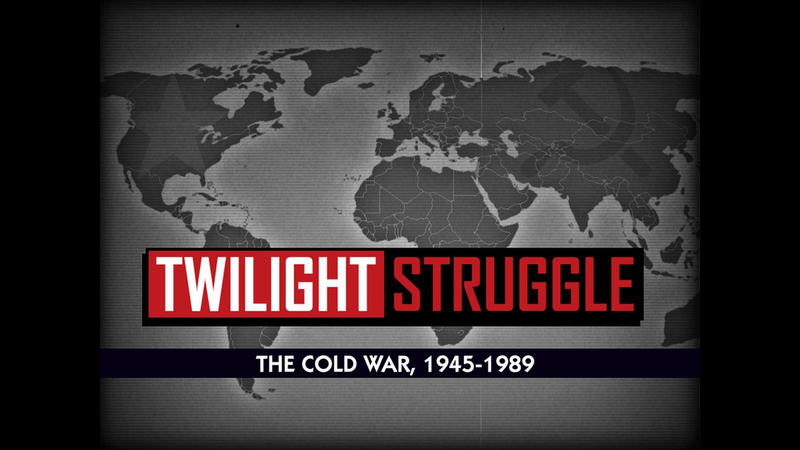 Twilight Struggle is available on the Google Play store for under £5. That is a small amount to play for a fantastic game. I may have to finally pull the trigger on this one. The app looks great. The app is certainly a great way to learn the game when playing against AI. Ohhhhh! So i’m SUPPOSED to be losing every game! I thought I was doing it wrong. The tutorial really is impressive – I at least know exactly WHY I’m losing! And I lost to the “I play a card and the opponent chooses the DefCon 1 option and I lose” scenario as well — USA played Olympics, USSR boycotted, boom – nuclear war!. Brutal! Fun game and a great port and thank you to all the Kickstarer supporters for helping make it a reality so that I could play it!